If you thought getting into university was stressful, w o a h, take a step back and read this book. This is basically a maze competition where the winner gets a scholarship and PTSD. #Kind And I really enjoyed myself with this one! The author is so lovely on instagram and has reached out and said kind things to me during my debut year (writing is hard, folks) so I was super excited to read my first book from her. It definitely didn't disappoint! Like coming from an angle where they live in a world of magic and ballgowns and ghouls. The society in this book has a very early 1900s vibe and it was all Males Rule and females can go have babies or whatever. I usually chaff at these story lines, because I'm so tired of sexism, it makes me ill. But this was brilliantly done. It hit us with discussions on what feminism is, how it is valid for girls to want to be in university and want to raise children. How there is no one way to be a "strong female character". How being rich and privileged can poison you if you don't actively take charge of your own thinking. It was really on point for today's world too and I loved this. I'm just sitting here feeling so full and warm with the fact that it featured two main girls: Rhen, who is into science and cutting up corpses and will instantly hack off her hair to fake being a boy for a chance at a better education. And also Seleni, who is soft and a little giddy about her boy crushes and is intelligent and forthright and takes risks and loves frills. It was so so nice omg thank you for girls who are badass and don't scorn femininity as well. Also their friendship was LIFE. They're cousins and so there for each other. 10/10 for epic female friendships. We get basically two camps: (1) the rich privileged snobs who are utter assholes and treat women like property, and (2) the soft and gruff boys who are full of respect and hope. I would be totally ok if Vincent and Germaine and Co all fell into the sea and got eaten by sirens. Lute and Beryll were adorable. I also loved that Beryll was the toffy stuck up boy...but learned and listened and checked his privilege. And Lute was just a SWEET FISHERMAN BOY. He has a disabled little brother too (and the disability rep was not ablest at all afajsdklafd I'm so happy) and their relationship is here to make your heart do all sorts of floppy happy things. It honestly gave me Caraval vibes! We have this rich old man who runs a contest every year to award scholarships. Only boys can enter, which is why Rhen and Seleni fake being boys to get in. The contest only takes a day and it's not the bulk of the book, but it is the stressful part. They go through a maze and locked rooms and get attacked by monsters and visions. They have to invent things and mix chemical compounds...and avoid getting backstabbed by the other competitors. I loved the magic and wildness of it! ➸The writing was so easy to be absorbed in! I just found myself flying through dozens of pages and losing time...which I looove while reading. The world felt easy to absorb and Rhen's voice was dynamic and winning. I loved her and when you love the characters, it's for the book to take up firm residence in your heart. this is definitely a story of feminism and love, and it deals with the fear of girls striking out in places they've been told to stay away from, but how one girl can truly cut a path for more. It's equal parts sweet with the family bonds and friendship...and vicious with the maze and monsters. And that cover?! I LOVE that cover. 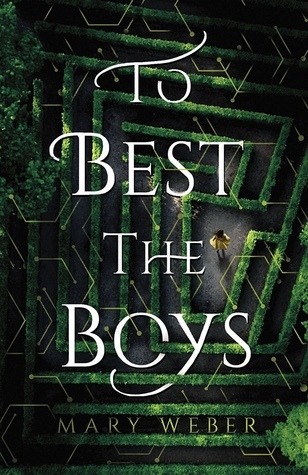 Sign into Goodreads to see if any of your friends have read To Best the Boys. Great review! I absolutely loved this book! @Toya: I'm glad you loved it!